Whether you're taking a boat to the lake or a camper across country, REESE Towpower<sup></sup> has supported you with trailer hitch balls for over 55 years. Our quality sets the standard for you to continuously count on us! Our Hitch Balls are tested tough leaving you with nothing to worry about except playing hard or working effectively. he patented Interlock<sup></sup> One Wrench Tightening System allows for one handed tightening, a breakthrough when compared to the traditional dual wrench flat hitch ball design, which required two hands, two wrenches. When installing Reese hitch balls, torque all 1 in. shank balls to 250 ft. lb. No other towing products company works this hard for you. So when you're ready to tow, Road trip, let's go! REESE Towpower<sup></sup> - TESTED TOUGH! REESE Towpower couplers are made of the highest quality steel construction. Several features make them easy to use while providing security for your trailer. FasLok couplers have an adjustable lock nut for proper ball tension. A trigger handle makes it easy to secure the coupler on the hitch ball. Handles have a hole in them which can fit a lock for added security. This Class II bolt-on coupler features the FasLok locking lever system to lock the coupler to hitch ball. This coupler accepts a 2 inch hitch ball, fits a 2-1/2 inch or 3 Inch trailer channel width, and has a 3,500 Lb. gross trailer capacity. REESE Towpower<sup></sup> couplers are made of the highest quality steel construction. Several features make them easy to use while providing security for your trailer. FasLok<sup></sup> couplers have an adjustable lock nut for proper ball tension. A trigger handle makes it easy to secure the coupler on the hitch ball. Handles have a hole in them which can fit a lock for added security. This Class I bolt-on coupler features the FasLok<sup></sup> locking lever system to lock the coupler to hitch ball. This Class I coupler accepts a 1-7/8 In. hitch ball, fits a 2-1/2 In. trailer channel width, and has a 2,000 Lb. gross trailer capacity. 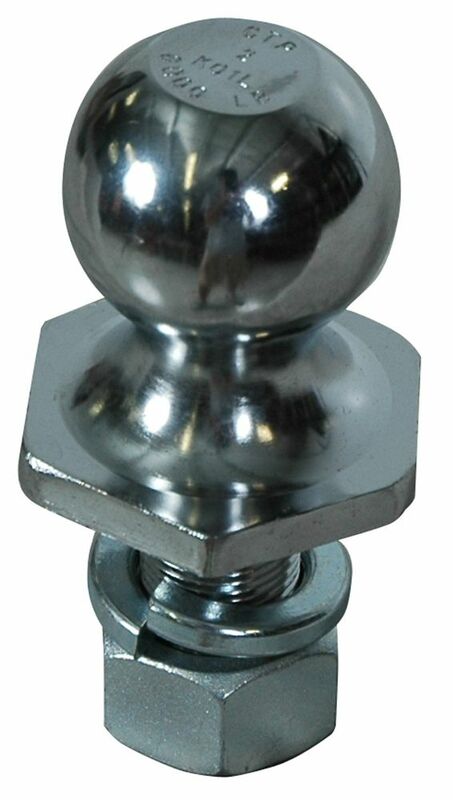 2-inch x 1-inch x 2-inch Chrome Steel InterLock Hitch Ball Whether you're taking a boat to the lake or a camper across country, REESE Towpower<sup></sup> has supported you with trailer hitch balls for over 55 years. Our quality sets the standard for you to continuously count on us! Our Hitch Balls are tested tough leaving you with nothing to worry about except playing hard or working effectively. he patented Interlock<sup></sup> One Wrench Tightening System allows for one handed tightening, a breakthrough when compared to the traditional dual wrench flat hitch ball design, which required two hands, two wrenches. When installing Reese hitch balls, torque all 1 in. shank balls to 250 ft. lb. No other towing products company works this hard for you. So when you're ready to tow, Road trip, let's go! REESE Towpower<sup></sup> - TESTED TOUGH!